While marketing experts argue if the age of mobile advertising has already come or not and everyone should use it, many companies already know and use methods that really work. At least one of Mobile Marketer articles describes several methods that proved their high effectiveness in mobile advertising. We have tried to comprehend their experience and analyze it from our point of view, supplementing it with our own comments and comments of other participants of the market. What working methods are we talking about? According to data brought by Rhythm NewMedia (the US-based advertising network specialized in rich media mobile advertising), usage of social buttons in mobile advertising significantly increases its effect. According to statistics of Rhythm NewMedia, adding social buttons to a fullscreen mobile banner increases the chances of click on this banner by 57%, and one of their clients has even noticed increase of clicks by 75%. Using such strategy is partly explained by general higher social activity of mobile users comparing to other users. The research conducted by Rhythm NewMedia shows that on average 67,7% of mobile users use Facebook at least once per day, while only 54% of non-mobile users visit it every day. However, the development of this process varies depending on a country. We need to be careful implementing this approach in Russia. We need to understand that the process of mobile socialization in Russia is not so plain as in the USA, Asia or Europe. The average ratio of smartphones penetration on Russia’s market is 19-23% (E-marketer, J’son&Partners), and only 53% of smartphones have social apps preinstalled and active. It means that it’s too early to talk about the trend of mobile internet socialization as a bulk marketing method so far. However, in 2013-2014 with general growth of smartphone usage in Russia and improvement of social apps usability we can expect significant results of measures which we can already plan today. Such practice certainly corresponds to all modern trends on the market, but just sending all traffic to Facebook is not the cheapest way of getting Likes at all. In this case, sending a visitor to a mobile landing page where he can not only Like this page, but also learn information about the product and maybe leave a request is more effective way. The mobile advertising network Greystripe believe that “size matters” when talking about monetization of mobile traffic. Their statistics show that fullscreen mobile banners bring quintuple revenue to developers and editors than traditionsl small banners (320×50 etc.) do. Fullscreen banners don’t annoy users. They can be easily closed and they usually appear during natural pauses, e.g. while the website or app is still loading. ‘Fullscreen banners significantly decrease the amount of accidental clicks typical to small banners’, sais Christina Hamilton, a marketing manager for Greystripe, ‘and the fullscreen advertisement can increase the effect of a campain five-fold. Moreover, fullscreen format helps editors to show less advertisement in general and avoid overloading the screen space of a smartphone that is usually already enough loaded with other banners. Yelena Pickunova, OMD: The main problem of fullscreen mobile advertising is lack of traffic for it in Russia. Only brand or service apps can afford fullscreen mobile advertising, and these apps currently lack necessary audience coverage. And developers of apps that do have necessary coverage (i.e. Yandex, Mail.ru) do not welcome such an approach. Apart from mobile apps there is enormous amount of traffic in mobile web and we can show beautiful fullscreen banners there with the same effect. In Russia we were first on the market who offered this format. The effect from it is really high as well as its potential, but the market has yet to learn how to use it properly. 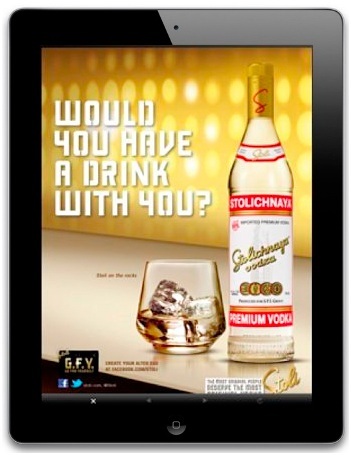 I’m glad to know that new formats of mobile advertising have reached Russia and are used here to the utmost extent. Such networks as OKEO and iVengo have launched last year, and these networks offer to get all advantages of fullscreen mobile banners everyone is talking about. Many tasks yet stand before our industry — to design new formats, to leave some that proved their ineffectivess, to disappoint ourselves in several directions of work. This way is similar to the way the “big internet” has once developed, and many new and interesting opportunities open up before us. Data brought by the advertising platform Kontera shows that effect from contextual ads in mobile is even higher than that in the web. So that, CTR of contextual ads placed in relevance with content is quintuple higher than the average mobile CTR. Mobile advertising has successfully started in Google search. The effect is explained by Google Analytics functionality (tracking of mobile applications after placing ads, comprehensive mobile analytics), and high clickability and affinity index of contextual advertising per se. A standard rich-media banner is a small banner that unfolds to full screen after a user clicks on it. Users do not click such banners too often because they do not know what this click may cause. The network Goldspot Media offers placing banners that already contain animation and interactive elements in their initial “small” condition. Goldspot Media state that the CTR of a properly designed and animated rich media banner is within 0,1-0,5%. The idea is to tell the user a mini story even before he clicks the banner and in such a way to catch his interest. In March, 2012, Goldspot conducted a campaign for Chevrolet. The first slide contained a common picture of Chevrolet Silverado, while the next slide showed information about promo that lasted during the month. 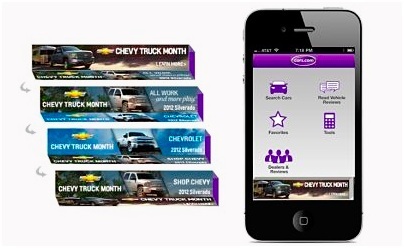 Users could also click the banner and see the video or “like” the Chevrolet page on Facebook. Yelena Pickunova, OMD: In Russia, the interest in rich media banners is suffering a serious crisis, as all banners are made using HTML5 technology, and their development is so expensive that it can cost all media placement budget. Therefore the evident advantages of this advertisement confront not less evident disadvantages of its cost.